Water Requirements: Regular to moderate moisture. A massive and impressive specimen, Washington palm, also called Mexican fan palm, is one of the most commonly planted palms due to its versatility and cold tolerance. They don’t require much maintenance and can be grown in many regions of the U.S. While plants can soar to almost 100 feet, you’ll more commonly see them top out around 40 or 50 feet in urban environments. They’re often used to line streets or accent large open areas. Due to their size, they’re not a good choice for small urban spaces. The leaves resemble large fans that span 4-6 feet each. 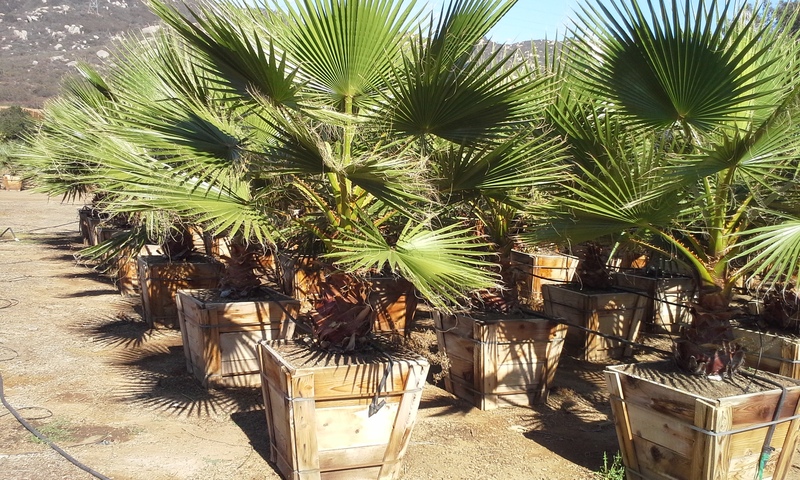 The most important maintenance practice associate with Washington palms is the regular removal of the large dead fronds that can accumulate as plants age. They can become a fire hazard or provide habitat for less desirable wildlife such as rodents. Plants can tolerate both sand and clay soil types, but well-draining soil is best. Once established, plants are drought tolerant, however look their best when giving regular moisture. Plant in a sunny location for best performance.